Sandra Ackley Whatever Happened to Bigfoot? We would also like to thank this year’s panel of Judges: Julie Dillon, Don Lacky, and Patricia Booze for their generous time and knowledge in helping judge this year’s show. We offer our congratulations to this year’s recipient of the Art Show Apprentice award, Jean Carlos. What are the mystery phrases? 90’s SF television show spanning five seasons. Quote from an alien character. 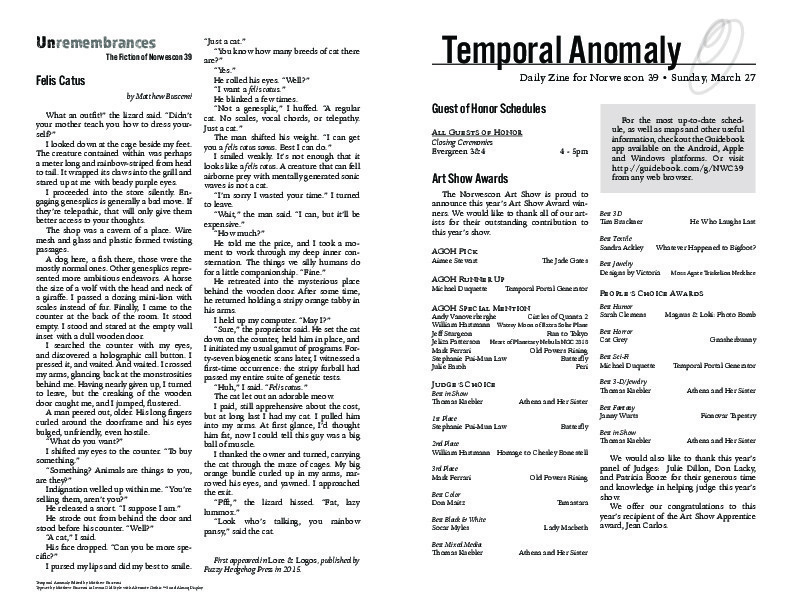 The editorial staff of Temporal Anomaly, your daily zine for Norwescon 39, would like to thank everyone who submitted content over the last four days. We couldn’t make this zine awesome without you. We had a great convention, and we hope you did, too! Horror As a Mirror (HOR08): Jeremy Zimmerman (M), Jude-Marie Green, K. M. Alexander. Costume Foundations IV: Practical Embellishments (COS27): Holly L. Forbis (M), Julie Zetterberg, Carmen Beaudry. Fukushima at Five (TEC02): Mike Brennan (M), Bart Kemper, Lillian Cohen-Moore. Alt-Tech & “What If” (TEC11): Stephen L. Gillett (M), Mike Brennan, Russell Ervin, Dr. Misty Marshall. Cooperative Board & Card Games (GAM04): Ogre Whiteside (M), David Fooden, Dylan S., Burton Gamble, Ryan Macklin. Susan DeFreitas Reading (R53): CANCELLED. Send an email to onionsandrosepetals@norwescon.org. Tag your feedback on social media with #NWC39, #NWCrose, or #NWConion. We know some of you missed our Movie Previews panel early Friday morning. But there’s so more news to tell! We’ll be taking over the Evergreen Shuttle Bay today at 2pm for a talk about movies. We didn’t even scratch the surface of “why? Why? WHY?” yet. It will be a fun back-and-forth without having to play previews in the dark. Spread the word and be there at two! The Beyond Reality Costumer’s Guild is sponsoring a raffle! The prizes are: a spectacular steampunk treasure chest filled to the brim with costume and fine jewelry, a brown leather jacket, a detailed hand-knit reversible Star Wars scarf, and a beautiful hand-made Victorian parasol. Tickets are $1 each, or eleven for $10, and the drawing will be held on Sunday at noon. Participants must be present at the convention to win, and must pick up their prizes by 2pm. It has come to our attention that rumors have been circulating regarding the “geek yogurt” on sale at the convention being made of geeks. The editoral staff has found no evidence with which to substantiate said rumors. I looked down at the cage beside my feet. The creature contained within was perhaps a meter long and rainbow-striped from head to tail. It wrapped its claws into the grill and stared up at me with beady purple eyes. I proceeded into the store silently. Engaging genesplics is generally a bad move. If they’re telepathic, that will only give them better access to your thoughts. The shop was a cavern of a place. Wire mesh and glass and plastic formed twisting passages. A dog here, a fish there, those were the mostly normal ones. Other genesplics represented more ambitious endeavors. A horse the size of a wolf with the head and neck of a giraffe. I passed a dozing mini-lion with scales instead of fur. Finally, I came to the counter at the back of the room. It stood empty. I stood and stared at the empty wall inset with a dull wooden door. I searched the counter with my eyes, and discovered a holographic call button. I pressed it, and waited. And waited. I crossed my arms, glancing back at the monstrosities behind me. Having nearly given up, I turned to leave, but the creaking of the wooden door caught me, and I jumped, flustered. A man peered out, older. His long fingers curled around the doorframe and his eyes bulged, unfriendly, even hostile. I pursed my lips and did my best to smile. I smiled weakly. It’s not enough that it looks like a felis catus. A creature that can fell airborne prey with mentally generated sonic waves is not a cat. “I’m sorry I wasted your time.” I turned to leave. He retreated into the mysterious place behind the wooden door. After some time, he returned holding a stripy orange tabby in his arms. “Sure,” the proprietor said. He set the cat down on the counter, held him in place, and I initiated my usual gamut of programs. Forty-seven biogenetic scans later, I witnessed a first-time occurrence: the stripy furball had passed my entire suite of genetic tests. The cat let out an adorable meow. I paid, still apprehensive about the cost, but at long last I had my cat. I pulled him into my arms. At first glance, I’d thought him fat, now I could tell this guy was a big ball of muscle. I thanked the owner and turned, carrying the cat through the maze of cages. My big orange bundle curled up in my arms, narrowed his eyes, and yawned. I approached the exit. “Look who’s talking, you rainbow pansy,” said the cat. First appeared in Lore & Logos, published by Fuzzy Hedgehog Press in 2015. Matthew Buscemi, “Temporal Anomaly (Sunday),” Norwescon History, accessed April 19, 2019, http://history.norwescon.org/items/show/205.